Bottecchia AV 803 2004 derailleur hanger 6061 T651, made with CNC technology. Black anodized. Lighter and more durable than the hanger series. 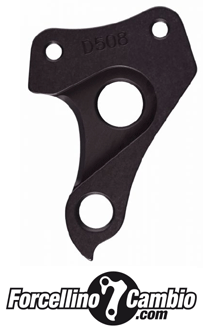 Bottecchia derailleur hanger 6061 T651, made with CNC technology. Made in Italy. Lighter and more durable than the hanger series. 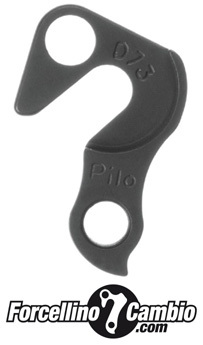 Bottecchia CC 6.90 derailleur hanger 6061 T651, made with CNC technology. Black anodized. Lighter and more durable than the hanger series. Derailleur hanger MTB Bottecchia Zoncolan 29" 2014 original spare part. Bottecchia Warrior RC 2005 derailleur hanger 6061 T651, made with CNC technology. Black anodized. Lighter and more durable than the hanger series. 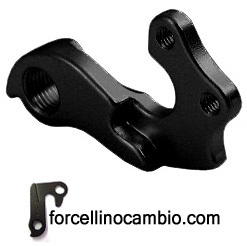 Bottecchia 100 TX55 2014 derailleur hanger 6061 T651, made with CNC technology. Black anodized. Lighter and more durable than the hanger series. Bottecchia FX 520 derailleur hanger 6061 T651, made with CNC technology. Black anodized. Lighter and more durable than the hanger series. Bottecchia Gavia 2015 derailleur hanger 6061 T651, made with CNC technology. Black anodized. Lighter and more durable than the hanger series.